If writing is your practice, the only way to fail is not to write. Anyway, a chapter I read yesterday really intrigued me, where she talked about posture. She goes on to say that if you write on the couch use a pillow and cross your legs. If you write in bed position yourself upright. Sit cross legged at your desk, hell, use a lecture/podium and write standing up (as Virginia Woolf did). Sher believes that when we write with our spines bent our energy gets caught up and that our writing will become stale and flat. 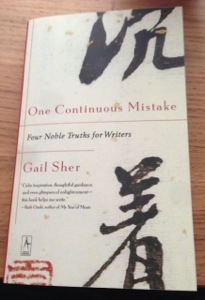 This entry was tagged authors, being a writer, book writers, Gail Sher, posture, Sitting, Writer, Writer Resources, writers, Writers Resources, Writing, writing a book. Bookmark the permalink. I don’t know about that, have to think on it. I do know if I’m bent too much it bothers my back. I don’t like to sit up when I write in bed though. I usually lie on my stomach with a pillow in front of me and write. I do like the cross legged position though and do that quite often. Another position I saw one writer suggest once was sitting on one of those exercise balls. I’ve thought about it, but not done it. Afraid I’d roll off and hurt myself…lol. (I’d end up in dead bug position then) :)Maybe I’ll try it one of these days. I have a ball, just use it for exercises though. I’d love to know how that works for you Vikki. Oh gee. Mercy me…I am a slob writer! Interesting – I tried to sit at desks for years, thinking it was the proper grown up way to write, but finally gave in and only ever sit on the couch with my legs crossed. Glad to know there is reason for it!! How interesting! I’d love to read great haiku too. Poor you having food poisoning. I don’t know about the grounding and power stuff, but it makes sense to adopt a posture that doesn’t cause pain or injury. Quite apart from that, I learned the hard way exactly how posture plays an important part in writing. During last year’s NaNoWriMo, I spent a lot of time writing with my feet up, sideways, on the sofa and my netbook balanced on my legs; ‘jazz typing’ as my acupuncturist friend described it. I’d had to visit him for treatment after suffering from a frozen shoulder, a condition that is far more painful and disruptive than it sounds. I am beginning to worry about my back I must say. Do you know, I completely believe that about posture because when I realise I’m slouching and stand up straight I feel a rush of vitality. Honestly! Actually thinking of setting up my desk for standing. So many writers blogging in the last month about how bad hips and backs have nigh on crippled them. I have both issues. Plus, there was that terrible article about how sitting for the better part of your day shortens your life more than being overweight or smoking (!) Eeeps! Will let you know how it goes. Oh gawd Melanie, that’s scary! Thanks honey, good luck, let me know how you get on. I always sit up straight to write. In fact, I rarely sit using the back of a chair — learnt this in Tai Chi. I usually sit on the edge of the seat, with my weight equally balanced between my bottom and the soles of my feet (held flat on the ground). It’s a case of getting in such a position on the chair that you can stand straight up from sitting without having to grasp hold of anything with your hands to assist you getting there. My laptop used to cause me back and neck problems, because it meant my neck was out of alignment with having to look down at the screen. Much prefer my desktop as I can sit upright, by having the monitor on a pile of books so my eyes are level with the top of the screen. Hate to say, I get neck ache writing in a notebook, too (sorry, Vikki, as I know you love your notebooks!). Thank you for sharing this about Gail Sher. It makes an invaluable post!